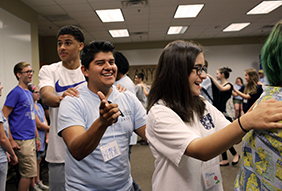 Anytown Leadership Institute is a leadership experience for incoming high school sophomores, juniors and seniors. Anytown takes place at Oklahoma State University in Stillwater and delegates stay in campus dormitories during the program. At Anytown, delegates build an inclusive community based on mutual respect and understanding. Delegates of diverse backgrounds have an opportunity to meet people whom they would not otherwise meet, and they often develop lifelong friendships and connections. During the program, delegates participate in a variety of workshops and activities that develop their awareness and skills to lead in a diverse society. In a respectful environment and guided by experienced staff, delegates have the opportunity to discuss topics such as bullying, racial discrimination, and gender stereotypes. Students also engage in action-planning for taking leadership on issues of inclusion and justice. 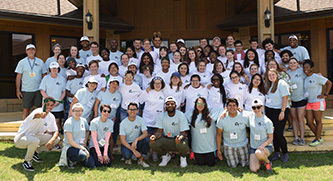 Over a thousand young leaders have graduated from the Anytown Leadership Institute since its inception in 1994. Anytown graduates represent a wide array of careers, including the arts, business, education, journalism, law, medicine, military and public service, scientific research, and social work. The application period for the 2019 session of Anytown Leadership Institute is now open. The deadline to apply for Anytown is June 15, 2019. Applications are available online. If you need assistance with the online application, or to request a paper application, contact OCCJ by email at info@occjok.org, or by phone at (918) 583-1361. Anytown covers serious topics, but in a supportive atmosphere where delegates make new friends, gain self-confidence and become stronger leaders. 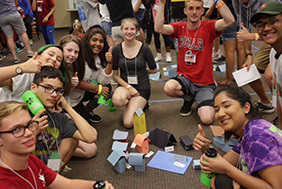 Anytown also features team-building activities, discussion groups, recreational time, and a talent show. Anytown delegates represent a wide variety of racial, religious, ethnic and economic backgrounds. The Anytown staff is made up of experienced co-directors and adult advisors, who are community leaders with human relations and communications skills, as well as college-age counselors who are Anytown alumni. Counselors provide guidance and facilitate the week’s learning process. The Anytown selection process begins with the submission of an application and a letter of recommendation from an adult advisor involved in a leadership activity listed on the application. 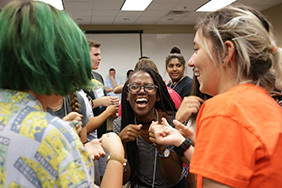 The fee for attending Anytown Leadership Institute is $450, which includes round-trip bus transportation from Tulsa or Oklahoma City, meals and housing, workshop materials, and an Anytown T-shirt. Scholarship assistance is available.